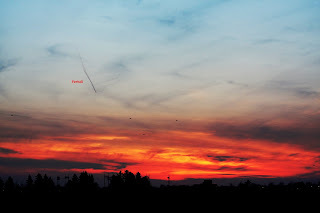 So I was out trying to image another Sunset when out of the blue a fireball appeared. To give you some idea of how rare these fireballs are, a trained observer, such as moi, can expect to be treated to one, once every 200 observing hours, factor in that it was a daytime fireball, more rare, also factor in the fact it was close to the Sun, more rare again and....catch breath... the fact that I had a focused camera ready to go, and that I would actually capture an image just after the break up with an image of the fragments, the chances of this happening, well, it boggles the mind just thinking of it, well it boggles my mind, mind you I'm easily boggled. 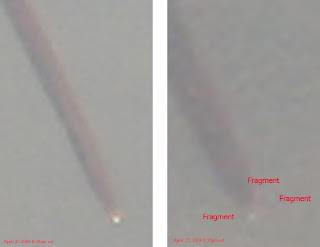 I get home to process the images to see what I've got, cropped and enlarged the images, turned out quite good actually, something like NASA might have on CNN, well maybe not NASA.. or CNN, but you get the idea. Fireballs come from a group of particles bigger then the usual specks of dust grains that cause your average meteor shower. They are caused by objects the size of pebbles people, unbelievable, but because of the high rate of speed they hit our atmosphere, up to 160,000 mph they create quite a show. Daytime fireballs usually have smoke trails which start at about 50 miles altitude, they usually burn out around 9-12 miles high. It is very rare that any of the meteoroid reaches the ground to become a meteorite because of something called Ablation, which is when the outer layers of the meteoroid continually vaporize due to the high speed collision with air molecules. I'll leave you now with an animated gif of my unbroke fireball. 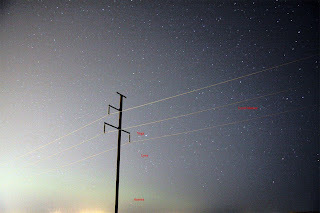 Got a cool image a couple days after the peak of the Lyrid shower when the Moon hadn't risen yet, above, while I was watching the meteor it looked odd, when I got home did the processing noticed the reason, either 2 meteors side by side or one broke up cool, and, and there is a start of an aurora, bottom left corner, the green part. Heads up, Sunday April 27th. wee hours of the morning you can see the Moon just passing under Jupiter, that's right another conjunction, how early, well it is closest to Jupiter as it rises, around 3:00 am, but it is still conjunctinely (word?) close at 5:30 am just before Sunrise. I'll be out early to get a pic. May is a crazy cool month for sky watchers, people, starting right away May 1st, look to the west-northwest 45 minutes after Sunset to see another stunning Pleiades gathering, this time with Mercury. I had mentioned before about the Eta Aquarids occuring May 6th, my bad, they are actually May 5th. 4:00 am just before the Sun rises, look to the east southeast around 15 degrees above the horizon, you have a new moon, so the contrast will be better, giving you brighter meteors and the amount of meteors varies on a 12 year cycle, which will peak between 2008-2010, so they are expecting, even though it's low on the horizon around 30 an hour. 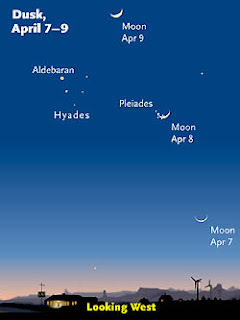 Mark your calendars, May 6th., again 45 minutes after Sunset for a beautiful gathering of a crescent Moon complete with earthshine, Mercury, the Pleiades and Aldebaran, the eye of Taurus the Bull with the Hyades star cluster, excellent photo op. 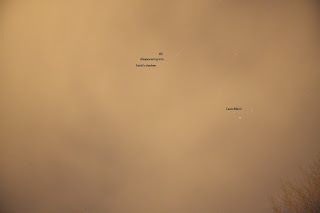 Look to the east southeast 45 minutes after Sunset. You may have noticed I added a countdown clock for the Martian landing of the Phoenix Mars Lander. The lander touches down on the Martian landscape May 25th. The lander will use parachutes and thruster rockets to slow it down from 12,000 MPH to just 5.4 MPH to hopefully have a soft touchdown. NASA has not had a successful power landing since the 70's, lets keep our fingers crossed. The lander has been given a tentative landing spot called "the Green Valley" a spot they are hoping will have plenty of ice within digging range of it's digging robotic arm so it can gather samples to analyse whether it had ever been able to support microbial life. I'll leave you now with a cool Lunar Halo animated gif taken about a month ago. Just a few hours before I took the above pic it was snowing so much that you couldn't see a few feet in front of you, but the Clear Sky Clock for my area said clear skies between 1:00 and 4:00 am, it has never let me down before so I got everything ready, camera, tripod, winter coat, gloves, toque just in case there was a break in the weather. Got a little sleep woke up around 1:00 am thinking no way it's going to be clear and I can get back to some nice cozy sleep in my warm bed, there will be other showers, May 5th to be exact, the Eta Aquarids which I will talk about later. Anyways go through the motions, go to the window and, oh crap....I mean...oh goodie, clear skies, the little voice in my head was saying, "go back to bed, this isn't the shower you're looking for", but I thought no way, I'm not listening to that stupid voice, I'm going out, not going to let the voice be the boss of me. Once out and set up it was great, it was quite, lots of fresh air and the Cosmos laid out before me. 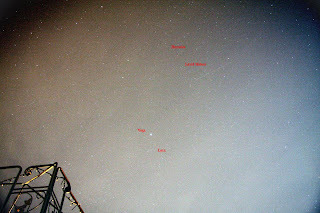 Now the thing with the Lyrids, they tend to be fast and short, reason being they hit the Earth's atmosphere head on and burn out quickly, I managed to capture a long one, right through Hercules keystone, the above image and in the image below I captured a couple meteors in the same pic last Thursday night, (since the shower runs from April 16-25), very cool. I don't know if you were able to get out and catch the shower, if you didn't, not to worry, mark your calenders, the next meteor shower is just around the corner, May 5th. The Eta Aquarids, and it's a moonless night, so they will be nice and bright, the best kind, there is a slight problem though, this shower's radiant, the constellation Aquarius only rises about an hour before morning twilight begins, around 4 am, but it should be a good show up to 30 an hour. The Aquarids shower is the result of flakes of dust and debris left behind by Halley's comet burning up in the Earth's atmosphere which by the way last visited us back in 1986. I will definitely be out, should be warmer and no full Moon, I'm there. Look to the East-South East just above the horizon 4:00 am May 5th. I'll leave you with yet another Moon with earthshine animated gif taken during it's last crescent phase. 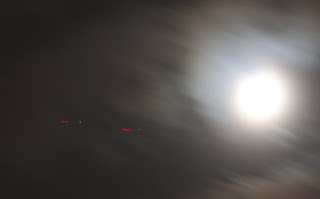 We had a couple of Lunar conjunctions, on April 11th. there was the Mars/ Moon conjunction, the image above, I had clear skies for that one and with the earthshine made for a pretty picture. 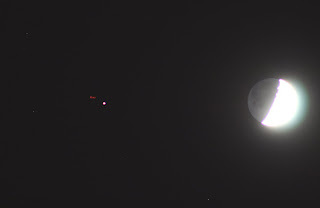 The image below was the Saturn /Lunar conjunction of April 14th. Had lots of fast moving clouds with little earthshine, image below, still made for a pretty image, note the fast moving clouds, at least they broke to give me a view of Saturn the Moon and Regulus, or the technical official name Alpha Leonis, the brightest star in the constellation Leo the Lion. Another friendly reminder about the upcoming Lyrid meteor shower Monday the 21st. through to the morning of the 22nd. This is the peak time for the shower, it actually starts April the 16th. through to the morning of the 25th. 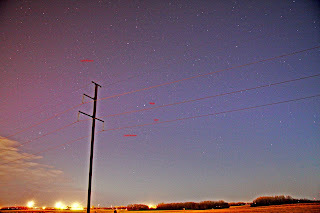 They are calling for snow the 21 and 22 here in Saskatoon so I was out to see what I could see last Thursday night, the last clear sky to be had for a week or so, I saw around 6 an hour average over the 3 hours I was out, not bad for a non peak night, and a huge one right over my head, where the camera wasn't pointing. 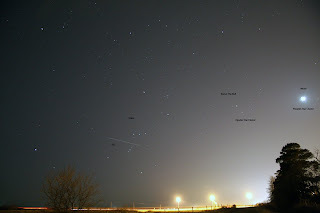 I got a shot of a couple meteors I will post after the event in case I get a break in the clouds on the 21st. Look to the NE around 11 pm EDT for the show to begin. The radiant or the place where the meteors appear to emanate from is the Lyra constellation. Expect 10- 15 an hour, by the way they are short and very fast, at least the ones I saw. The Moon will be full so will take a little away from the contrast but hey it's a meteor shower, nothing better then wishing on a falling star. One of the things I try to do here at Black holes is make the sky a little more user friendly, more enjoyable so that when you go out for a walk at night you know a little bit more, like what is that bright star next to the Moon, or where to look for a conjunction or when the next meteor shower is. Our Royal Astronomical Society of Canada President Scott Young came up with a TOP TEN list of ways to turn young people off astronomy, it was of course written for other amateur astronomers but you can still get a laugh or two out of it. 10: Show them a deep sky object in a small or medium sized scope as their first look. 9: Bash the Tasco scope they already own as not worth using. 8: Lapse into jargon and spew technical details and costs of your gear, and how you need to have perfect gear and perfect conditions or it's not worth observing. 6: Spend time talking with the inner circle at a Centre meeting and ignore the newbies. 5: Explain how using a computer-aided telescope isn't real astronomy. 4: Assume the newbie at the public star night will see the same level of detail that your 35-years-of-experience-eyes can see. 3: Show them Venus, Mercury, an asteroid, an outer planet or dwarf planet, a double star, a variable star, a planetary nebula, a galaxy, a star cluster, or about any northern-hemisphere deep-sky object other than the Orion Nebula. 2: Show them Mars, EXCEPT at a favourable opposition in a big scope with good seeing and a red filter. 1: Mock their misconceptions or beliefs about the universe the first time you meet them(and they meet you). I must admit that even though I own property on the Moon I had never heard of the Purbach Cross, (sometimes called Werner X named after a nearby crater) until I read about it on page 45 of the April edition of Astronomy Magazine. I took one look at this strikingly elusive phenomena and said to myself, "I have got to get me one of those." Striking because it stands out from the rest of the Lunar landscape, like it doesn't belong, elusive because it only occurs during the Moon's 1st. 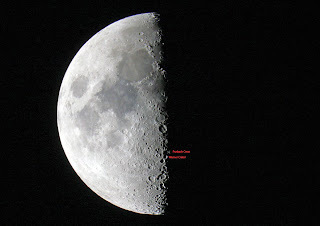 quarter phase, (the first half Moon after the new Moon), and then only for a few hours, and on top of that, because the Moon's phases repeat every 29.53 days, you can't view this phenomena every month from the same location, you will be 12 hours early day 29, or 12 hours late day 30. As I was reading this article I thought hey I've taken literally 100's of lunar images, maybe I've unwittingly, because that's how I usually do things, captured an image of the cross, after going through my collection of Lunar images, no luck. The article gave the exact date and time the cross would be available for viewing, April 12th. 8 pm EDT. So April 12th. comes around and I have clear skies, hopefully it will be our location's turn for the feature to show itself. So I'm getting excited, go out to my POD, fire up the scope attach my Canon directly to said scope, point it at the Moon, push the shutter button, look at the camera's monitor, there it was,.................people, I had a moment, actually I'm having a moment right now thinking about the moment I had back then. The phenomena is created when Sunlight reflects off the higher crater walls of 3 back to back craters, Purbach, Blanchinus and LaCaille. If you would like your own personal X moment a list of the dates in Universal Time for the rest of the year when the Sun will be at the proper angle to create the X are below. 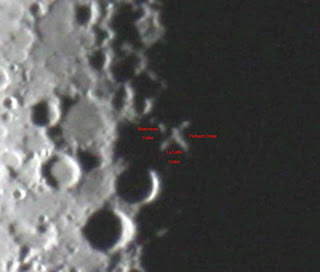 You will need binoculars or a telescope to view the phenomena, look at the terminator just south of the Lunar equator. September 7, 0945 UT; October 6, 2126 UT; November 5, 1029 UT; December 5, 0050 UT. Japan Aerospace Exploration Agency has released new Earthrise and Earthset videos taken by their Lunar satellite Kaguya, and they are nothing short of amazing. Also released are newly created topographic maps of the Moon, created with the data collected by the orbiter, 10 times more accurate then previous maps done of the Lunar surface, they also show locations of valuable minerals such as uranium, thorium and potassium. Below is a YouTube video of the New Earthrise/Earthset released by Jaxa. 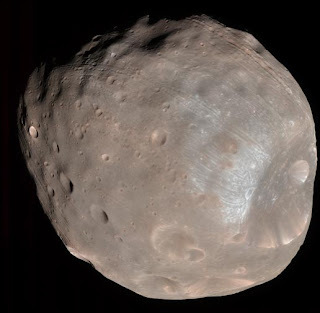 Julie over at Virtual Voyage, an awesome site with great photography, gave me a heads up about some new images that had been released of the Mars Moon Phobos. I had talked a little about this moonlet here, in my Beaver Moon post. 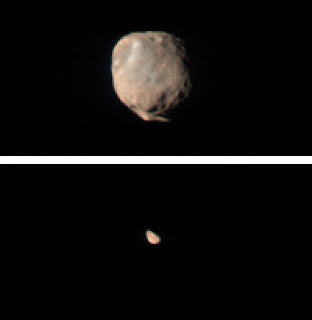 Back then NASA had just released some new images of the Mars moons Phobos and Deimos. 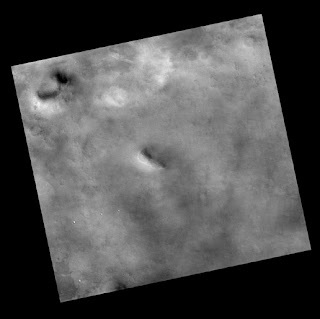 The Mars Reconnaissance Orbiter took 2 images from around 6,000 kms out from the moonlet and combined them together for a stereo view. 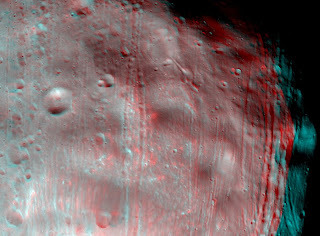 NASA also released some anaglyph images of the moonlet. If you have red /blue 3d glasses, and I do, you can see the little moon like it's coming out of the screen towards you, scary stuff. This moonlet may have a lot of ice water, because of this there is a lot of interest in this little moon, so much so that Russia had launched a couple of spacecraft to Phobos. Phobos 1 was lost after a couple of months due to programming errors and Phobos 2 had made it to the moonlet took a picture of a UFO, so some say, and then one of it's computers died. Never say never, Russian and China have joined together to send Phobos Grunt to land on Phobos and Mars and then return with samples of their surfaces, a very ambitious mission indeed. Phobos Grunt is slated to launch next year. The night after the Moon/ Pleiades conjunction I was back out and got a cool image of the Moon with earthshine in clouds, I'll leave you now with an animated gif of this image. What a spectacular show, last night just after the Sun set the Pleiades open star cluster and the Moon complete with earthshine crossed paths. Couldn't have asked for a better night, clear skies and above zero temperatures, actually I think I overdressed for the occasion, didn't really need the gloves or the toque, spring has arrived and what an opening act. I took a wide angle shot as well of the event as the International Space Station was passing by, people the sky was so full of stuff, you had Orion, Taurus the Bull, the Pleiades, the Moon and to top it all off a guest appearance from the ISS all in the same field of view, awesome! The next big event to watch out for will be the Lyrid meteor shower the night of April 21-22. This is usually one of the better meteor showers but because of the full Moon the impact won't be as great, but still worth a view. I will be out snapping images for you if you happen to miss it. the radiant or point to which the meteors seem to start from is in the Lyra constellation, look to the NE. around 10 pm the 21st for the start of the shower, expect 10-20 an hour. Our company was involved in Earth Hour and after the event our President sent out an email to the companies employees with some cool results of the initiative which I would like to relay to you at this time. At least 50 million people participated worldwide; in Canada 250,000 people and 6,000 businesses signed up online in the lead up to the event. Electricity use dropped 8.7% in Toronto, a 4%drop was reported from Ottawa, and a 5% drop was reported across Ontario as a whole. By turning off the lights for one hour on Saturday March 29th. 2008 , participants in Ontario alone prevented 200 tonnes of greenhouse gases from polluting our atmosphere. I'll leave you now with one of my Moonrises as an animated gif. I was so lucky to be able to get the above image Wednesday April 2nd. the night before the International Space Station and the Automated Transfer Vehicle docked. Very cool to see the little ATV follow behind the big bright ISS the length of the sky, like a baby duckling following it's mother, very cute, I mean not kitten playing with a ball of string cute, but space cute. Cute isn't word I throw around lightly on this blog, this blog is about space stuff, space is one of the harshest environments known to humankind, not cute. The ATV docked with the ISS Thursday April 3rd at 10:45 am EDT. The Automated Transfer Vehicle, Jules Verne, named after the science fiction writer carries important cargo to the station such as water, scientific equipment, oxygen, nitrogen and propellant. Jules Verne will be docked with the ISS for 6 months allowing the crew to unload it's cargo then reload the vehicle with the station's waste products. Just before the ATV leaves it will fire it's thrusters to push the ISS into a higher orbit, detach and then fire it's thrusters once again to put it into a de-orbit for a controlled destructive re-entry over the Pacific Ocean. The docking procedure was fully automated, the ATV is guided by lasers, that's right lasers to guide it to the docking port, anything that uses lasers to guide it is too cool. I get so excited when I talk about stuff like the ATV, Shuttle and the ISS, people we have different countries working together for a common good to do hard science, so that instead of flying by the stars of the Big Dipper so to speak, we can one day fly to. Jules Verne is the first of at least seven ATVs planned for the ISS. The ATV was developed by the European Space Agency over 10 years at a cost of 1.9 billion dollars for an exchange of astronaut slots in the upcoming ISS crews. 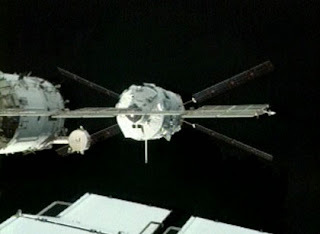 The ATV class cargo ship can carry up to 3 times the amount of payload as the current station service vehicles the Russian Soyuz and Progress spacecraft. Get ready for a beautiful conjunction/occultation of the crescent Moon complete with earthshine and the Pleiades star cluster this coming Tuesday April 8th. Look to the west just after Sunset for the stunning gathering, hopefully I'll have clear skies to take some pics. I'll leave you now with a clip I put together of the ATV following the ISS the night of April 2nd. I'v been sucking wind lately with trying to come up with titles, woke up 5:30 am do the post before work, think what will I be talking about, lets see the International Space Station, Gemini, Mars...and they're kinda conjuncting,...done, good enough. 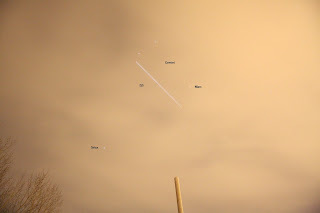 The above image was possible due of course to my camera but also a web site called Heavens Above. You type in your location latitude and longitude, which you can find here and it comes back with flybys of the various satellites that will pass over your location, it gives you the start and end times, the altitude and magnitude, plus a couple maps. The map above was the one I used for the ISS last Saturday. 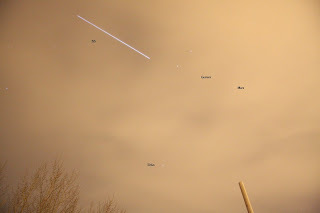 I knew that at 9:23 pm the ISS would rise above the west horizon, it would reach it's max altitude in Gemini around 9:28 pm, and then disappear into the shadow of the Earth shortly after, it also tells you how high it is, the flyby that night was at 372 km. So of course it's cloudy, even though the weather network says it isn't, I go out to my spot just in case it isn't cloudy out there, or maybe the clouds will fly away by the time I get there. Get to my site look to the sky, and there are clouds. They don't look to be moving out of the way anytime soon. I'm about to go back to the car to leave and I notice the star Sirius trying to burn through the clouds, and think the ISS is much brighter and bigger, it might work. 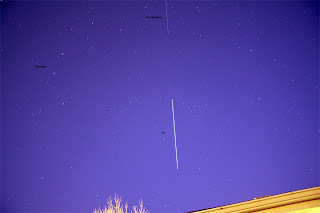 I was able to get 4 pics before the ISS disappeared into the Earth's shadow, the image above. The ISS is looking especially bright these days with all the additions like the Columbus Laboratory giving it more overall surface area for Sunlight reflection. 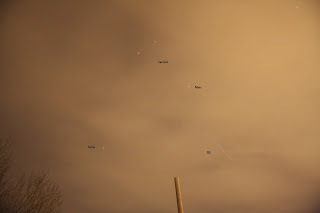 I'll leave you with a video I put together of the images I took of the ISS flyby.